Pro-GreenMX has some exciting news to bring you! We are now partnering with Kuberg Motorcycles as their recommended cleaner! What does this mean? 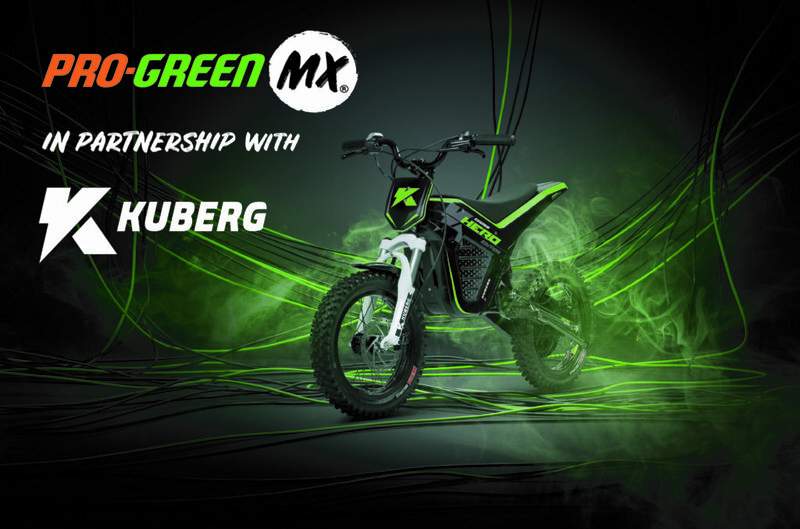 Kuberg design and manufacture cutting-edge electric bikes which are sold across the world and of course they need the right maintenance in order to look and perform like new for longer. Why Pro-GreenMX? Here at Pro-GreenMX we pride ourselves on being a genuine salt-free cleaner. Our cleaning products have earnt the trust in the motocross industry as a product that does what it is supposed to – which is to clean and protect your bike without causing any damage from harsh chemicals. How can this help my Electric Bike? Electric bikes are becoming more popular and they require different maintenance to motocross bikes – however you can still use the same products of ours. Pro-GreenMX Bike Wash is the perfect product to use on eBikes. Why? Firstly, as it is completely free of any form of salts, there will not be a calcium layer build-up on the motor brushes which will occur over time when using other branded cleaners, and this can lead to the motor failing far quicker than it should. Secondly, as it contains antistatic properties, it will not affect the current produced from the electrics which prevents engine cut-outs. Additionally, our After-Shine 101 is an essential must-have for your eBike. Why? It will keep your Kuberg bike looking like new and giving it a shiny, streak-free finish! Most importantly, it will provide you with a protective layer, first protecting the electrics and helping to dispense excess water as it dries, making cleaning easier on your next ride! Still interested in finding out more about our salt-free cleaning products? Stay tuned for our next blog post about why you should switch to a salt-free cleaner.